Published: Oct. 21, 2018 at 01:51 p.m.
Indianapolis Colts tight end Erik Swoope dashes across the middle for a 17-yard touchdown against the Buffalo Bills. Published: Oct. 14, 2018 at 03:34 p.m.
Indianapolis Colts quarterback Andrew Luck teams up with Erik Swoope for a quick 2-yard touchdown. 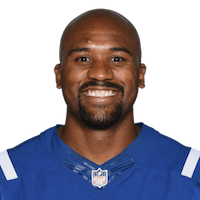 Published: Oct. 4, 2018 at 11:45 p.m.
Indianapolis Colts tight end Erik Swoope catches for a 27-yard gain with a spinning move at the goal-line. Published: Oct. 4, 2018 at 11:00 p.m.
Indianapolis Colts tight end Erik Swoope catches for a 13-yard touchdown, his first of the 2018 season, against the New England Patriots.